Danish Cathrine Dufour did the double at the 2013 European Young Riders Championships in Compiegne, France, winning the kur gold medal on Sunday afternoon 14 July 2013 after having claimed individual test gold the day before. Not only did the sympathetic Dane return home with double gold, but she also extended her title as ruling European Young Riders Champion for the second consecutive year, after sweeping all the medals at the 2012 European Championships in Berne, Switzerland, last year. However, earning that Kur gold was a tad bit more difficult this year with Dutch Stephanie Kooijman breathing down her neck. After an explosive team test, in which the three tempi changes went bust, Dufour dropped to an unusual seventh place in the ranking (71.053%). The rider did express she felt a lot of pressure in Compiegne defending her title, but she was able to achieve that tunnel focus and set the record straight by winning the individual test. On a boiling hot Sunday for the Kur, Dufour was able to cook her temperamental chestnut at the right temperature even though Atterupgaards Cassidy (by Caprimond x Donnerhall) was still hot to trot. Riding to the same music as in Berne (arranged by Jacqueline Vriese), Dufour had many highlights in her test, but there still were a few beauty errors. The halt at entry was behind the vertical and it quickly became obvious that Cathrine had to ride below tempo again in trot to keep her gelding from combusting. She rode beautiful lines with half passes, followed by trot extensions as well as a trot zig zag. The collected walk was outstanding well regulated in rhythm but it needed a bit more energy. The extended canter was very uphill, the half pirouette right big, the left one better. Dufour rode three tempi changes on curved lines. The canter music, featuring Led Zeppelin's Kashmir, was too busy for the tempo of the canter. The panel of judges, consisting of Umbach (LUX), Myhre (NOR), Judet (FRA), Markowski (POL) and Kogan (RUS), were unanimous in placing Dufour first with an overall of 83.600%. Judge Umbach had her at 90.375% (! ), whereas the four other judges were round 81-82%. In her last year at Young Riders', Dufour felt a major sense of relief that she was able to reclaim her double title. "After yesterday I was calm," Dufour said at the press conference after the medal ceremony. "I love my freestyle. We made it last year and it took 8 months to be made. It was a big project but it paid off. I can build it up. Cassidy was a bit more calm so I could ride more in canter." Dufour will be making the transition to the Under 25 category but admitted that Cassidy is not yet on point for the transition. "He's ready in the canter work, you saw it on Thursday," she joked. "The piaffe is still a bit more difficult but he's hot enough. We deliberately stopped training it in December." Cathrine Dufour is a very well liked rider amongst her team mates and already serves as role model to many juniors, who want to have pictures taken with her. Unfortunately, the Danish rider can not be very often seen at competitions as she consciously chooses not to compete her horses too much. 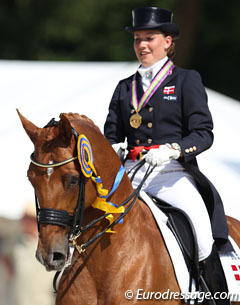 She usually rides only one CDI at the beginning of the show season, the Danish Championships and then the Europeans. "I think it's difficult to make the horses peak more than once," Dufour told Eurodressage. "I train them very carefully and think it's too rough for my horses to peak, then relax several times per season. So I do it to take of care of them." Dufour was able to create a gap with silver medal winning Stephanie Kooijman, who also rode a very strong freestyle, but scored less both on the technical and artistic level. Kooijman rode a brisk, forward test on her tall Dutch warmblood gelding Winston (by OO Seven x Cocktail). Her trot music is up-tempo trance which is too quick for the massive movements of her horse. Winston showed good shoulders-in and a thalf pass left but lost some swing in the one to the right. The walk was well ridden, but not as ground covering and pure as Cassidy's. In canter, Winston makes big uphill strides, the pirouette left was very nice, the right one ok. The tempi changes were correct, the four time really nice, but in general the canter work looked a bit less fresh than in the team test. The pair scored 79.225% to finish second. "Yesterday he was a bit tired. I didn't know what happened but today he heard the music and was really nice to ride," Kooijman explained. Stephanie's music was extremely high tempo and modern, which contrasted with many freestyles with softer, more orchestrated music. "I like that the trot music is harder. It's good for his trot. The walk and canter music is a bit more quiet," she said. 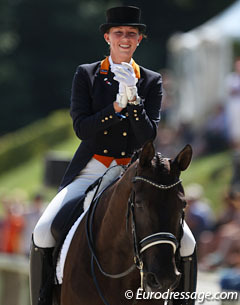 Kooijman and Winston will have little time to rest after Compiegne as the 2013 Dutch Dressage Championships are this weekend already. "I'll see if he's fresh," Stephanie stated. "Friday it's the team test and on Sunday the kur. After that he'll get vacation and then we'll start training for a higher level." Kooijman still has another year left at Young Riders but said she'll be playing with the Grand Prix work over the winter. "We'll see how it goes with the piaffe and pasage. We already trained it a bit and he can do it," she added. Head judge at C, Isabelle Judet from France, was ecstatic about the quality of riding in the Young Riders kur finals. "We had an exceptional group," Judet commented. "Yesterday it was already a great competition and enjoyed the quality. Many riders were at their best. Today we knew it would be interesting to see what would happened with the weather conditions, the the third day of competition and the fact that some already gave everything yesterday. Some riders made more mistakes and we have to judge those too. There were only two horses with a clear round. Stephanie's Winston was more fresh and recovered the quality of his team test. Catherine was careful in trot and we wanted to see more expression in trot but she made up for that in canter." When asked what the major difference was between gold and silver, Judet stated that Cassidy's quality in walk and canter made the difference. Judet finished by saying that the judging was quite to the point with the overall ranking, even though there were a few differences between the individual judges. "We can express ourselves, but the decision is democratic. We are a team of judges and it's the average of everybody," she said. Juliette Piotrowski was able to secure her third spot on the podium after winning team and individual test silver earlier in the week. Aboard her 8-year old Oldenburg bred Sir Diamond (by Sandro Hit x Donnerhall), Piotrowski was able to keep the flashy expression in her test. The black stallion has amazing freedom in the shoulder and is very scopy and far reaching in the forehand in the extended trot, but the hind legs were out. Also in the half pass right, the black struggles to cross behind and step under. Still the lateral movements were ridden with much forward energy and bounce. Piotrowski upped the degree of technical difficulty by adding the element of collected walk, followed by a canter half pirouette to her floorplan. The four tempi's on the circkle were huge, but there was a small hiccup in the transition from the canter half pass right to the half pirouette and in the left pirouette the horse lost impulsion as he had to poo. She scored 76.425%. "I was very relaxed to go into the kur," said Piotrowski, who is trained by her Grand Prix mom Claudia Haller. "I already had two medals which I didn't expect. I definitely didn't expect a third one. My horse is only 8-years old but he really hung in there these days. He was still fresh today but of course I felt this was his third test." British Pippa Hutton exceeded all expectations by finishing fourth aboard Philip Woof's British bred Hanoverian mare Duela (by Dimaggio x Alabaster). Throughout the week the chestnut mare impressed with her strong canter work, established flying changes and uphill tendency. She has a clear 4-beat walk. Only in trot Duela could have more bounce, but she obediently executed all lateral movements. With temperatures soaring into the 30 ° C, many horses which were hopefuls for a top placing struggled to appear fresh in the ring and made mistakes, which put Hutton and Duela at an advantage to move into fourth place with 73.200%. Her fourth place was only ever reached once before by a British Young Rider: Charlotte Edmonds with Broomford Locarno at Pratoni del Vivaro back in 2002. “Pippa’s a very cool customer under pressure – it’s where she really scores. 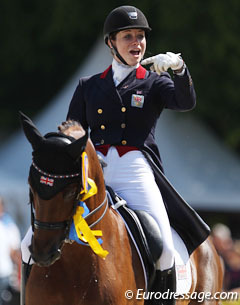 She rode a fantastic freestyle,” said GB Chef d’Equipe Claire Moir. “Her result was down to flair, choreography and the confidence to take calculated risks. When it was suggested that she ride the three-time changes with one hand she simply said ‘OK, right’. The whole family [the Hutton family] has a great deal of experience in Juniors and Young Riders. Pippa has grown up with it so she knew the score – she knows how it all works. German Charlott Maria Schurmann was lucky to have qualified for the kur as there were several big communication errors in her individual test, but the judges still awarded that ride with a generous 70.579%. The new duo was the the third highest scoring German and earned a ticket for the Kur. Schurmann, however, was troubled by problems with the music as the wrong version of her freestyle was played. Midway her test she was allowed to start over again but Charlott Maria handled it like a pro, staying calm and collected. She gave it another try on her Celle State stud licensed Hanoverian stalion Edward (by Embassy III) and made the best out of a bad situation. While the contact with the bit was lovely and the horse apeared to listen to his rider, Edward was slightly affected by the weather and could have been a bit sharper on the aids. He made a transition from canter to trot via walk and there was an issue in the three tempi changes. Schurmann posted a score of 73.075% to land in the top five at the 2013 European Championships. Junior and Young Riders Championships. Contact us if you are interested in prints of your photos!